A reclining chair is an upholstered chair with a metal mechanism activated by the user so that the back is pushed out and a foot rest rises up to accommodate the user's lower legs. Most recliners are armchairs, meaning they include arms. Upholstered backs and seats make the chair a truly comfortable piece of furniture. Reclining chairs or sofas are called "action" or "motion" furniture in that they move or change shape. Some recliners are activated by the sitter pulling on a lever; others are activated by the sitter pushing back in the chair with some force. One of the earliest designs for a reclining chair was published in a British periodical, Ackennann's Repository of Arts, in 1813. The "Reclining Patent Chair" was a prototype for hundreds of such chairs that were made throughout the century. Browne and Ash, upholsterers and cabinetmakers in New York, advertised "Improved Patent Self Acting Reclining, Elevating, and Revolving, Recumbent Chairs and Sofas" in 1855. Cabinetmaker George J. Henkels featured a reclining chair, which could be manipulated by the sitter without complicated machinery. The late nineteenth century recliner known as the "Morris Chair" was not devised by artist and designer William Morris but by William Watt in 1883 and manufactured by the decorative arts manufacturing firm Morris and Company (founded by William Morris)—hence its name. Mechanisms that transformed this chair to a recliner varied; however, most were quite simple, consisting of a rod or series of pegs that permit the back of the armchair to recline and rest against the pegs or metal. The frames were of wood (often quite massive) with upholstered cushions for back and seat. Such Morris Chairs were advertised as comfortable seating furniture, as are recliners today. Throughout the late nineteenth century and early twentieth century, there were many companies that produced innovative, comfortable "easy chairs" that reclined. Some included built-in magazine racks and practical, washable cushions. La-Z-Boy Incorporated, founded by Edwin J. Shoemaker and Edward M. Knabusch in 1929, designed a patentable reclining chair mechanism that they felt was unbeatable. The pair guaranteed the mechanism for the lifetime of the recliner, an ingenious marketing tool for the company. Today, La-Z-Boy is one of the few companies that extensively tests the activating mechanism, as well as the upholstery and frame, to ensure that their customers are getting the quality they are guaranteed. Primary components of the recliner include the frame, the metal activating mechanism, the foam or upholstery padding, and the upholstery fabric. While materials of these components vary according to manufacturer and specific style charateristics, generally the materials are as described. The frame is made out of wood, often hard-woods, since the chair receives much motion or weight shifting as it moves from a conventional chair to a recliner. The frame is reinforced with metal nuts, bolts, and steel corners or supports on some styles. Some fiberboard may be used in minor frame construction or back support. The metal activating mechanism, which converts the chair into a recliner, is of stamped steel. Metal is also used for the springs in the upholstered seat. Padding of upholstered backs is a foam that may be sculpted, such as polyurethane foam. All hard corners of foam blocks are padded and softened by a material such as polyester batting sheets. Some companies have abandoned foam that contain chlorofluorocarbons (CFCs) in order to be more ecologically responsible. Exposed wood on the arms, feet, or back may be more expensive hardwoods such as maple or oak that is stained and/or varnished. Upholstery fabric varies dramatically from piece to piece even within one company. All must be fairly durable as the chairs are pushed and pulled as pieces of action furniture. Recliners are upholstered in leather, cotton, natural-synthetic fiber combinations, or solely of synthetic fibers that are easy to keep clean and fire resistant. A residential furniture designer may bounce an idea off of a merchandising manager or marketer for an idea for a recliner; often, new products are the result of a design sketch completed by an inhouse designer. Every piece is targeted to sell for a specific price at this point in the design process; the market for the piece is identified; and the new product's fit in the line of products available is determined. Manufacturers of recliners often produce up to 100,000 recliners in a single style, so these companies must be confident that consumers will be drawn to the product. The designers sketch and submit a prototype for final approval. 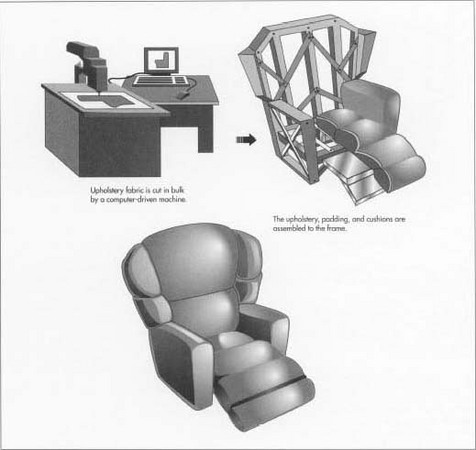 Full-scale drawings of new products are required by some companies, and this, along with marketing information, is handed off to the product development team so that the new recliner may be devised for full-scale production. The product development team takes the recliner from sketches, to working prototype, to manufacturing instructions for full-scale production. The team consists of at least one of each of the following: upholstery designer, sewing technician, pattern layout technician, a wood technician, and a Computer-Aided Design (CAD) engineer. The team physically builds a prototype; and once the prototype is approved, the preproduction phase begins. A manufacturing plant is chosen and the prototype is test produced on the machinery by staff to see if it can be successfully created. Once the prototype has been successfully produced at one factory, the specifications and materials are electronically shipped to all factories for another test run. The computer-based specifications assist in programming stamping machines, cutting machines, etc. After the small run of the new recliner is successfully executed, full production is initiated, and each plant produces several thousand recliners per day. Recliners, like many pieces of upholstered furniture, are assembled in stages with components put together in sections. All components are then pulled together in final assembly. The frame, including the back, are constructed of planed, measured, shaped, and assembled wood. Rigid frames are put together with nuts, bolts, nails, and/or staples. The framing is laborious work, and individuals often work alone to hand-construct this part of the recliner. The frame is sent to a holding area, where it will await further assembly. The frame is made out of wood often hardwoods, since the chair receives much motion or weight shifting as it moves from a conventional chair to a recliner. Padding of upholstered backs is a foam that may be sculpted, such as polyurethane foam. All hard corners of foam blocks are padded and softened by a material such as polyester batting sheets. are cut from steel in stamping machines. The metal mechanisms are then attached to the chair frame. 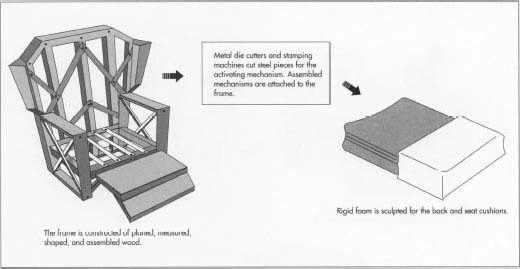 Foam bodies for the upholstered parts (back and seat) are sculpted from a rigid foam, such as polyurethane, by cutting, slicing, or shaping with saws to conform with a desired profile. Patterns or templates for cutting the upholstery fabric are sent electronically from the product development team to the cutting departments of the various manufacturing facilities. This computer data is programmed into the computer-driven cutting machine, which cuts approximately 40 layers of fabric at a time. The cut fabric is removed from the machine, sorted, marked, and stored for delivery to sewers. The cut pieces of upholstery are delivered to the sewers, who work on industrial grade sewing machines, to stitch all pieces of the covers for the foam seats together. The empty cushion covers are then sent to the cataloguer, who stores the cushions for the upholsterer. Next is upholstery assembly, in which polyurethane foam, polyester fiberfill, die-cut fiberboard, and covers or seats are sent to the upholsterer. Edges are softened by gluing padding of some sort, often polyester fiberfill, to the hard edges of the foam. The air bubbles are sucked out of the foam bodies, thus compressing them. The foam bodies are then pushed into the sewn cushion in order to fill it out neatly. The upholstery covers are nailed and stapled to the seats and backs. During final assembly, the backs and seats are assembled to the seat frame, the activating mechanism is attached to the frame, the decorative skirt is added (depending on the style of the recliner), and final inspection occurs. Recliners are upholstered in leather, cotton, natural-synthetic fiber combinations, or solely of synthetic fibers that are easy to keep clean and fire resistant. During final assembly, the backs and seats are assembled to the seat frame, the activating mechanism is attached to the frame, the decorative skirt is added (depending on the style of the recliner), and final inspection occurs. such as fabric stretch, seam slippage, colorfastness, and flammability. Some companies conduct much more extensive testing on their residential-use motion furniture, so that they may assure their clients that the product will perform consistently. Ensign, Robert. Always a Leader. La-Z-Boy Chair Company, 1987. Hanks, David. Innovative Furniture in America from 1800-Present. Horizon Press, 1981. Powell, James D., ed. "New La-Z-Boy Chair Plant Sets Stage for Growth." Furniture Methods and Materials, March 1976, pp. 10.